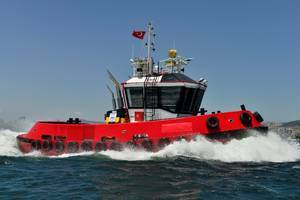 Gökçay, the first RApport 1600-SX tug, was run through its paces by her builders, Sanmar Shipyards, in late May and showed excellent performance in all respects. The new steel twin screw harbor tug is designed for high performance at a competitive cost. It has increased beam for better stability and excellent visibility in all directions from the compact wheelhouse. Conventional twin screw propulsion with twin nozzles and four rudders provide a bollard pull of 21 tons and a top speed of 11.5 knots with excellent maneuverability. The propulsion system consists of twin 650 kW Caterpillar C18 engines, Reintjes 5.5:1 reverse/reduction gears, 120 mm stainless steel shafts, and 1450 mm 5-bladed propellers in #37 nozzles. Twin high aspect ratio rudders are fitted behind each nozzle. The fuel system is a simple 2-tank arrangement with wing tanks port and starboard, centrally located to have minimal effect on trim as they are drawn down. The engines are fitted with dry exhausts with polished stainless steel tail pipes. With large aft facing windows in the wheelhouse and low profile funnels the towing equipment and most of the aft deck is visible to the operator. A machinery casing located between the funnels provides a convenient removal route for large items of machinery including an entire main engine. A 25 ton tow hook is fitted on the aft deck for general towing duties with an electric or hydraulic towing winch available as options. Double pipe bollards are fitted in the bulwarks for mooring, two forward and two aft, and stainless steel mooring rings in the bulwarks. Fendering is provided to suit each client's requirements with the standard being 250 mm "D" fenders at the sheer and vertical "W" fenders around the bow. A push knee with a 300 x 300 mm "D" fender can be fitted on the bow if needed. For line boat service a standard pipe rope guard is available to protect the house and the mast can be ordered as a folding type. Heavy duty lifting lugs for a 3-point hoisting tackle are standard equipment on every boat. There are overnight accommodations in the foc'sle for a crew of three, including: two cabins, pantry, mess, washroom with shower. The new RApport 1600-SX designed exclusively for Sanmar Shipyards is a safe, robust, and seaworthy tug ideal for general harbor duties. It meets all international and Class standards for construction and stability and is built to a very high standard of finish by Sanmar Shipyards in Istanbul, Turkey. ClassNK released the latest version of its design support software PrimeShip-HULL (HCSR) Ver.6.0.